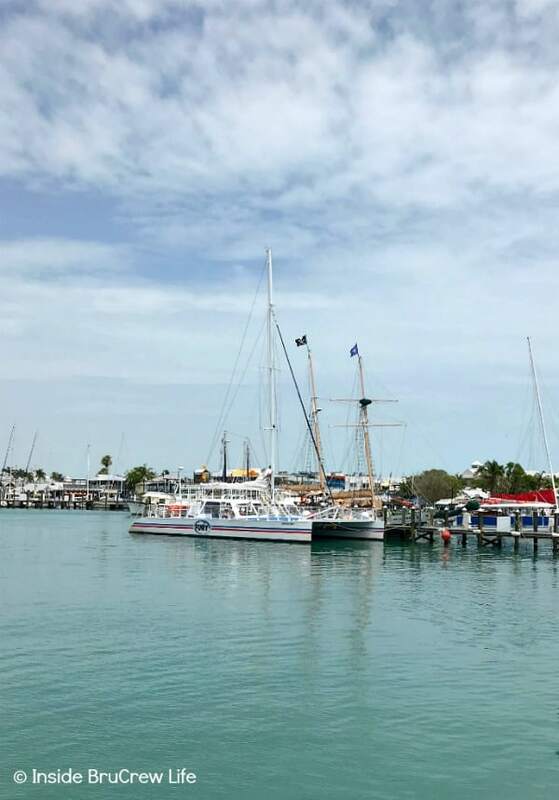 If you find yourself on the island from a cruise or just taking a day trip, Exploring Key West in a Day is possible. Make sure you wear good walking shoes and use sunscreen because you will be out all day. 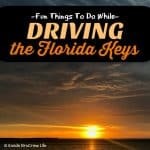 A few months ago, we took a family road trip and discovered Fun Things to Do while Driving the Florida Keys. 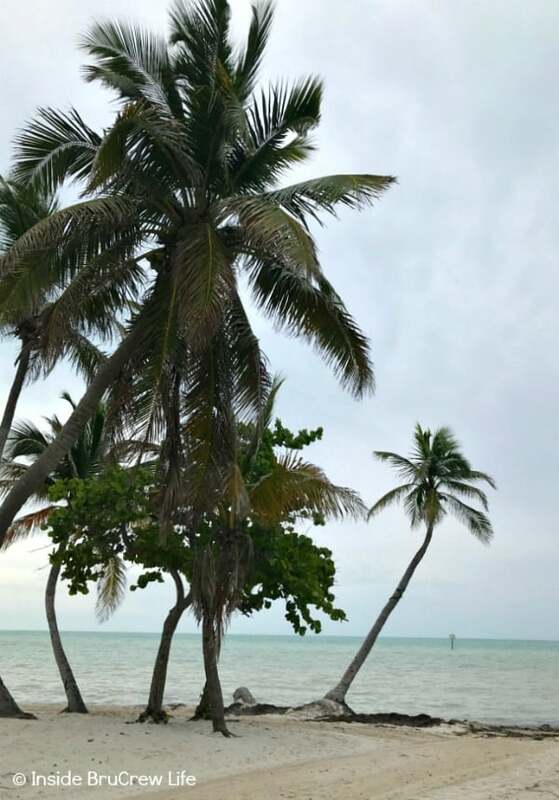 Of course, our journey took us to the end of the islands where we spent a full day exploring Key West. 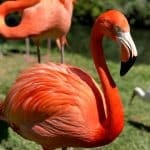 There are so many things to do in Key West, but we only had one day. 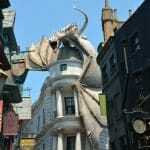 So we picked a few attractions and things to visit and left the rest for another trip. 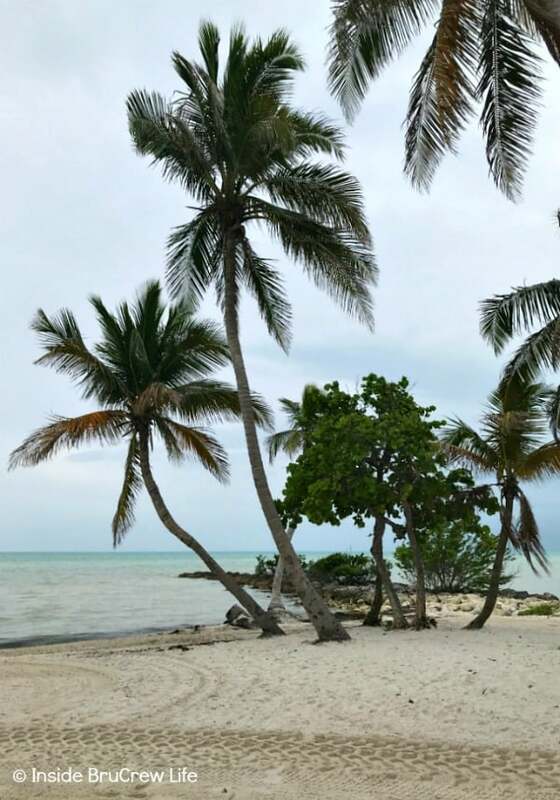 One of the main public beaches on Key West is Smathers Beach. This 1/2 mile long man-made beach is located on the Eastern side of the island. 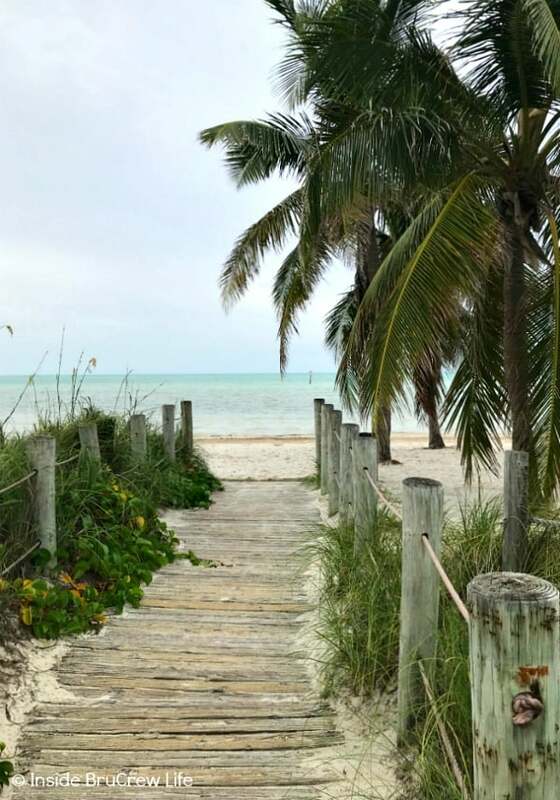 It has volleyball nets, lots of parking along the street, concession stands, restrooms, picnic areas, and chair and water sports equipment rentals. We stayed at a hotel along the water on this side of the island, so in the morning we got up and ran down the road to Smathers Beach. Working off all that key lime pie we kept finding was a must. We usually pack workout clothes whenever we travel because it’s important to us to stay consistent with exercise and motion. 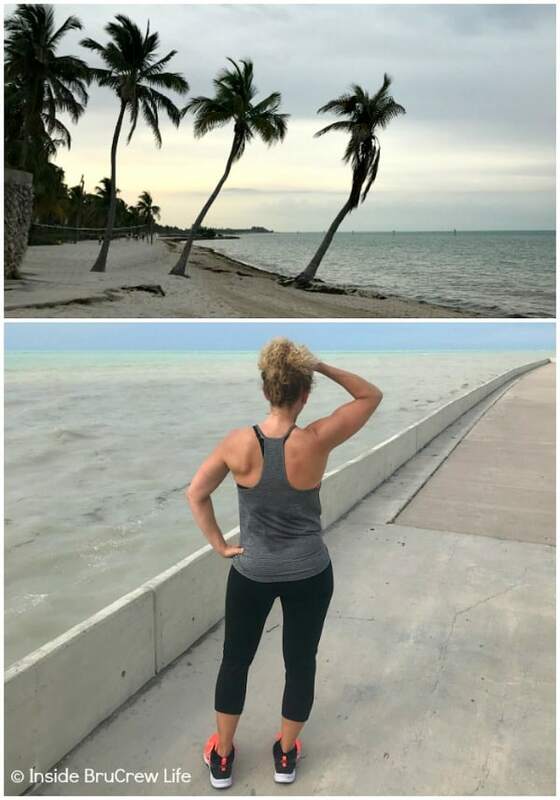 With only one day to explore Key West, we didn’t actually get in the water. 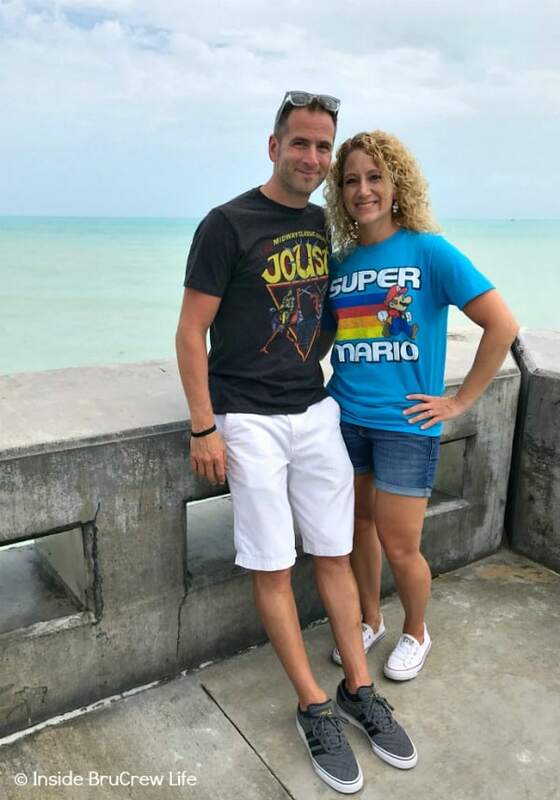 We just wandered around the beach in the early morning reminiscing about our honeymoon and how we stopped at this very same point 20 years ago. We headed back to the hotel to get the kids up and ready for a day of walking around town. 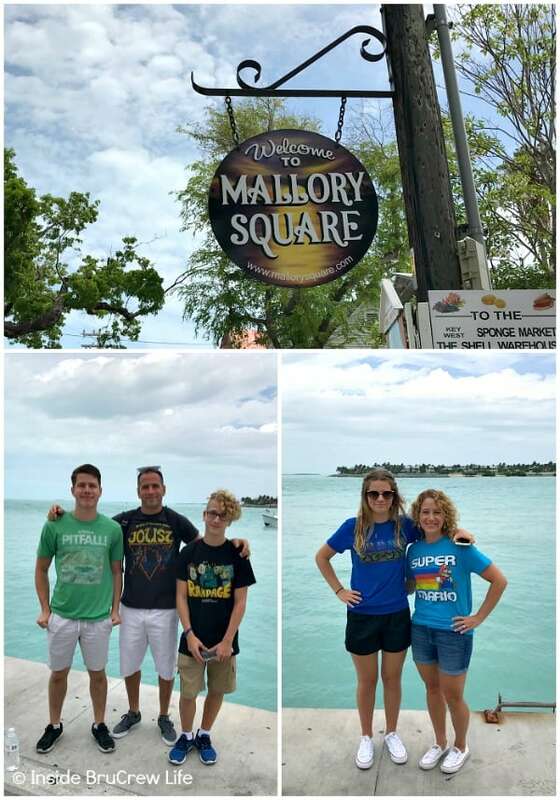 Our first stop was Mallory Square. During the day the streets and boardwalk are filled with people taking pictures and shopping. If you come back around 5 pm, you will find all kinds of street performers and food vendors. People gather here to watch the gorgeous sunsets that happen over the water. 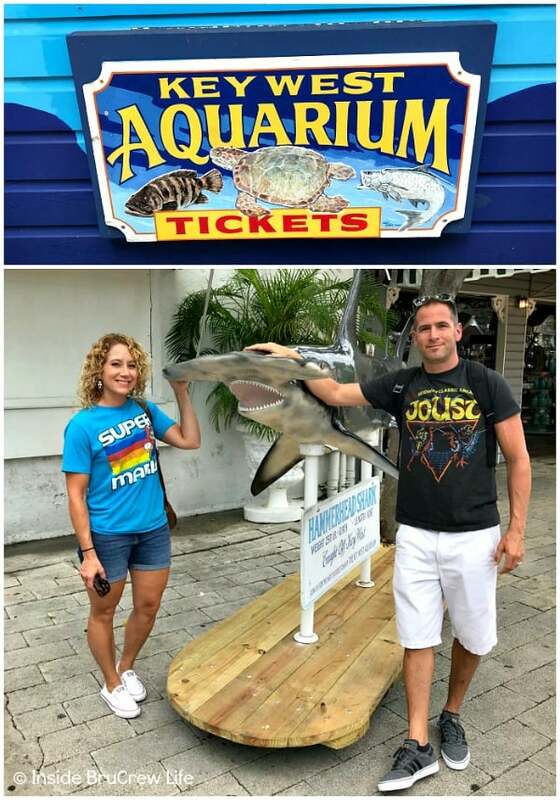 While we were at Mallory Square, we visited the Key West Aquarium that is located there. 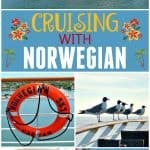 This is a popular attraction for all ages. 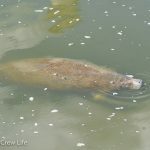 It is home to alligators, sharks, jellyfish, turtles, and many other marine life animals. 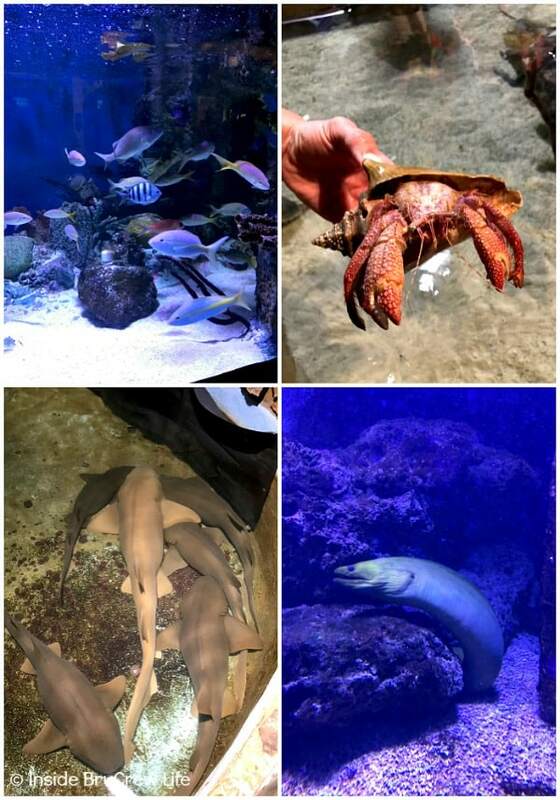 They also have a touch tank where they feature a variety of sea life like conch, sea stars, and horseshoe crabs. 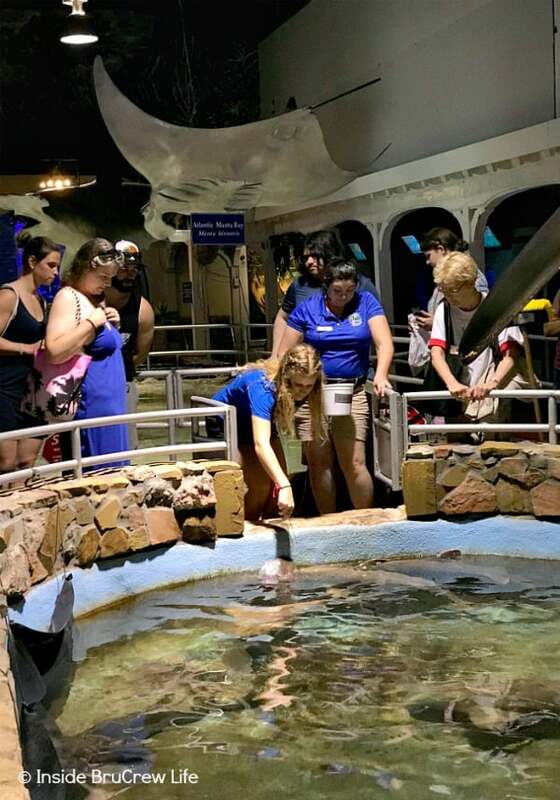 Guests are able to reach into the water and touch or pick up the different sea creatures. We also had an opportunity to listen to a live talk on sharks and many facts about them. Did you know that most sharks will not attack humans? They generally prey on the weak or sick sea life instead. I’m still not going to go swimming very deep in the ocean though. Watching Jaws at a young age scarred me for life!!! Our daughter got picked to help feed the reef sharks after the aquarium representative finished sharing her presentation. She said it was a little intimidating to reach over and have a bunch of sharks come to the top of the tank at you. After the presentation, we walked around looking at each tank and just marveling at the wonderful and amazing animals that God created. 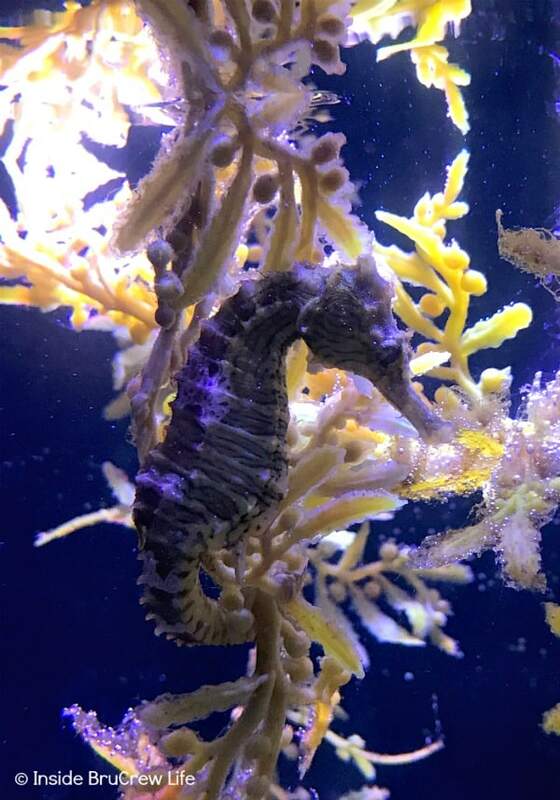 Isn’t this seahorse just the coolest thing ever? It was fun to watch their back fins open up and flutter when they would move from plant to plant. 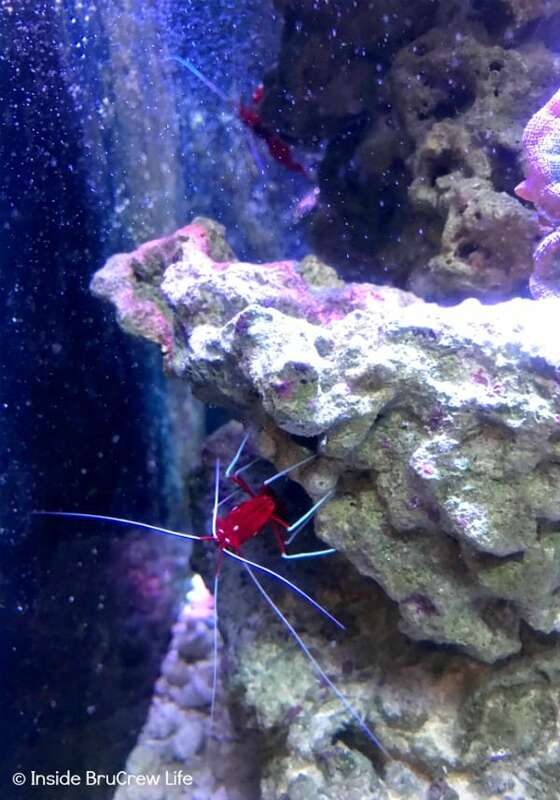 I also never realized that some shrimp were such a vibrant red color. These little creatures were fun to watch as they crawled around the rocks in their tanks. We enjoyed getting up close and personal with all these fascinating sea creatures. 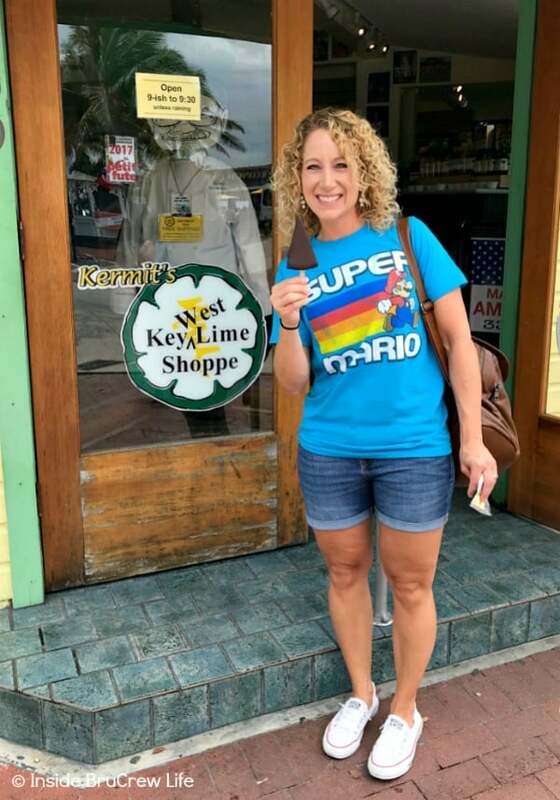 Of course, no trip to Key West is complete with a trip to Kermit’s Key Lime Shoppe. Give me all the key lime pie!!! 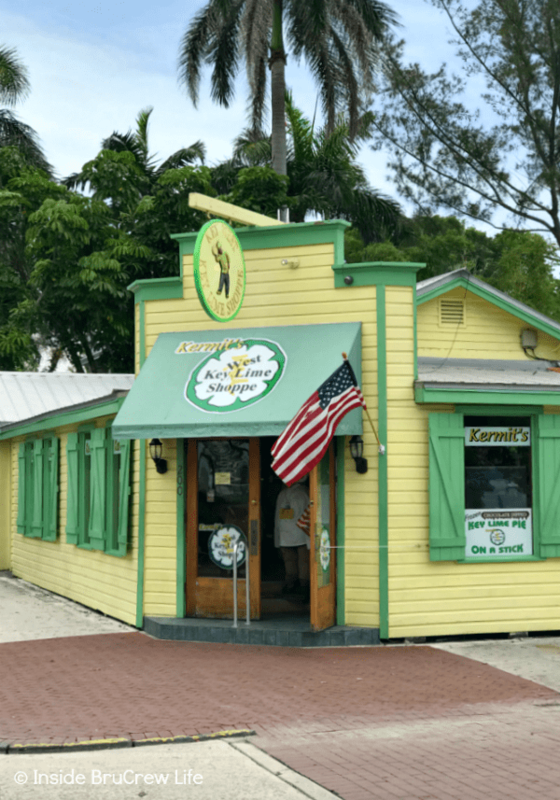 We walked over to the bright yellow building, so we could enjoy a slice of chocolate dipped key lime pie. There is something so delicious and refreshing about eating this treat on a hot summer day! 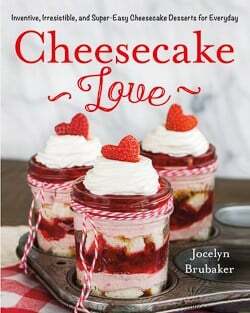 If pie isn’t your thing, they also offer many other things like cookies, sauces, candies, and jellies. After our pie tasting, we walked around the pier and looked at all the boats in the marina. 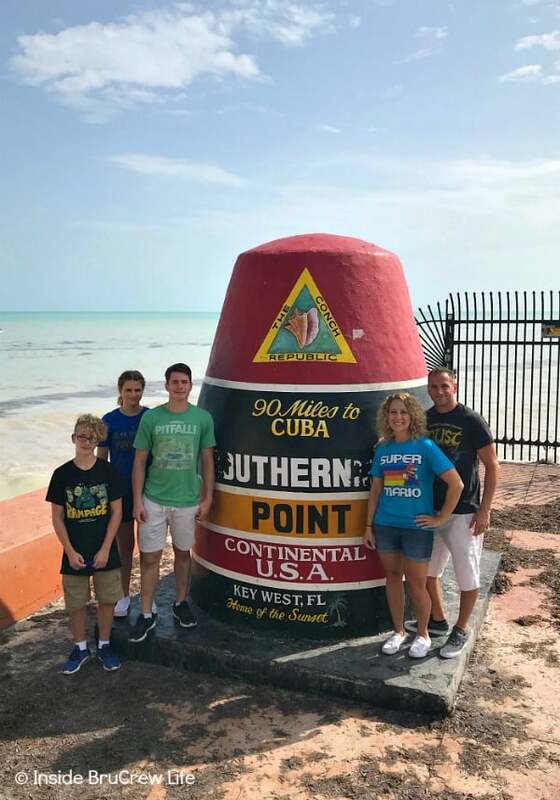 We have visited Key West a few times in the past, but we have never gone to the southernmost point for a picture. 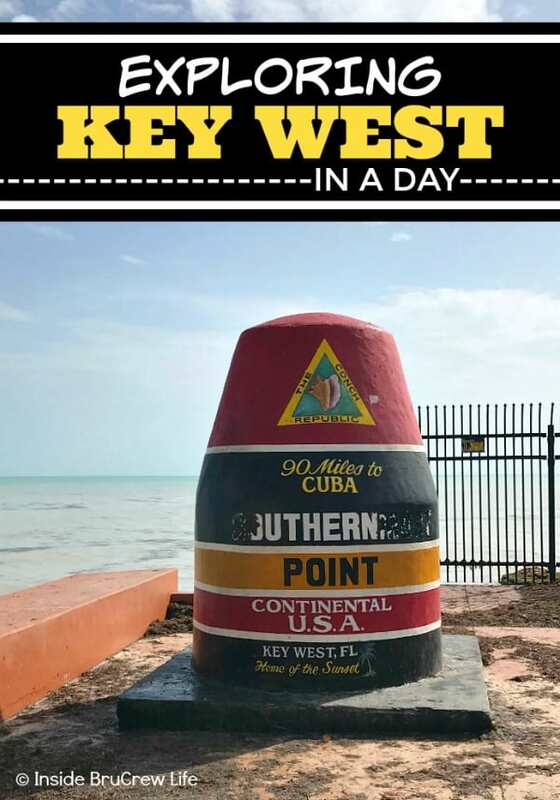 This concrete buoy is located at the intersections of Whitehead and South Street and is just 90 miles from Cuba. This famous landmark has become a most stop point for tourists, so make sure you head there first thing in the morning if you want to avoid long lines. If you get there later in the day, be prepared to wait in line for at least 30 minutes to get your picture. Everyone in line is super friendly, so just ask the people in front or behind you if they will snap your photo of you in exchange for you taking theirs. We also stopped at Ana’s Cuban Cafe down the street from the buoy for a quick lunch. 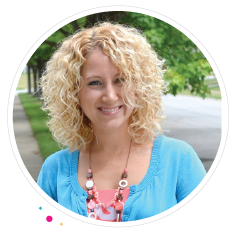 They have an extensive list of sandwiches and drinks that you can enjoy on their front porch. I tried the Cuban Mix sandwich, and it was delicious!!! As we drove around the island we stopped to see Higgs Beach. This public beach with free parking also offers volleyball nets, a playground, picnic tables, and a full service restaurant. We also walked out on to the White Street Pier near the beach and enjoyed the turquoise water views. 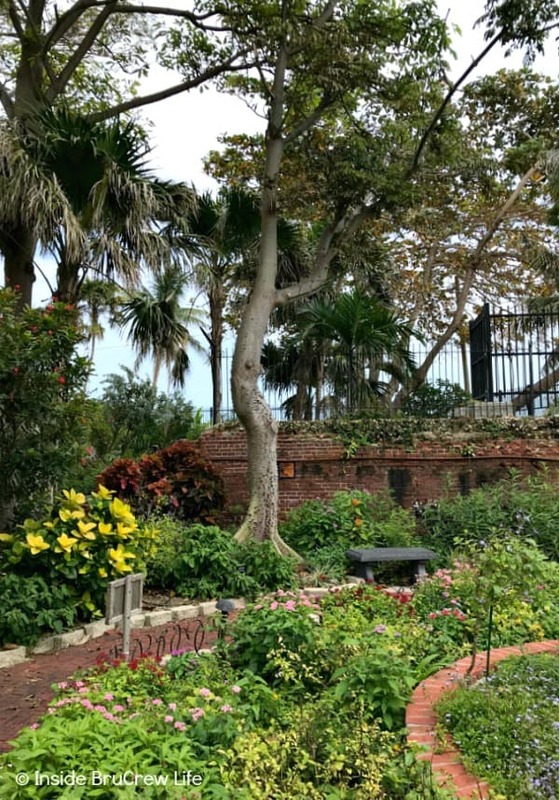 Near the beach you will find West Martello Tower. 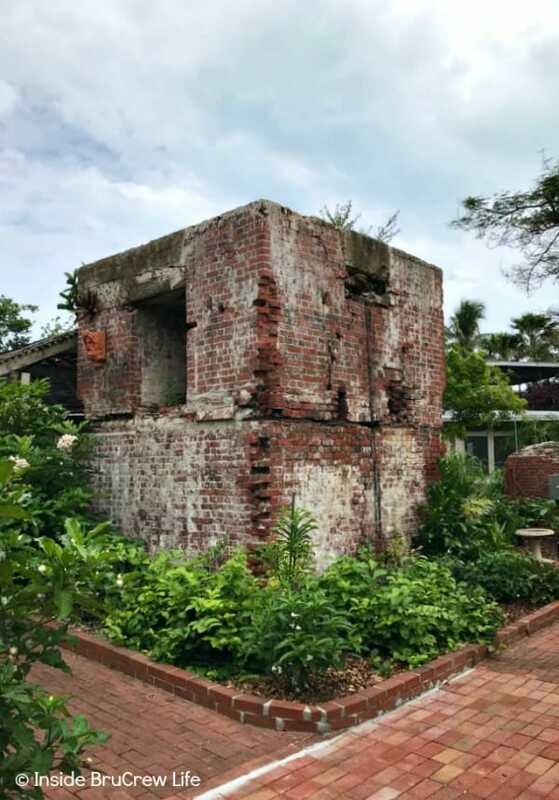 This historic tower was built during the Civil War and is one of the three Cival War structures that are still remaining on the island. 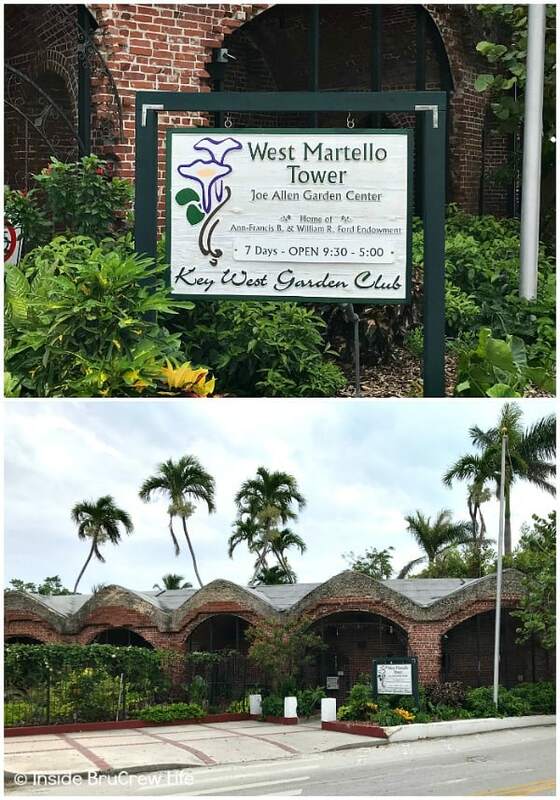 When the tower was threatened to be torn down, the Key West Garden Club stepped in to preserve the historic site. 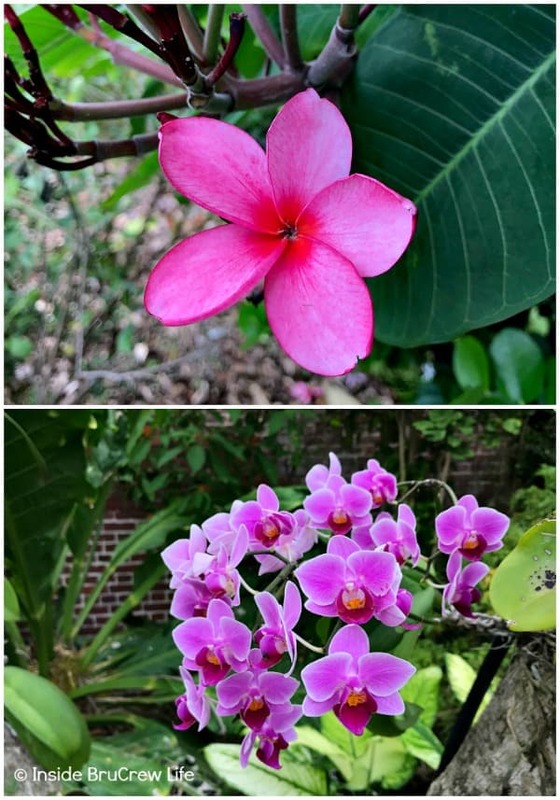 The club has planted many different kinds of tropical plants that are donated and taken care of by volunteers. 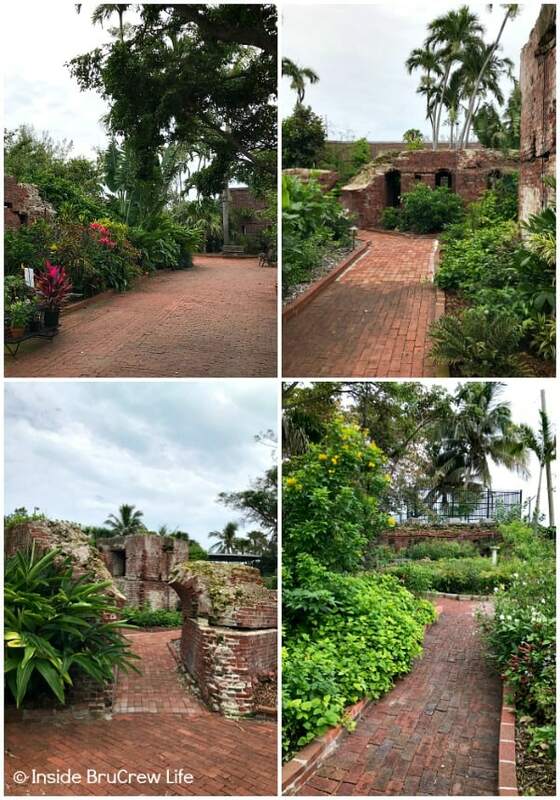 Admission to the tower is free, and you can explore the fort by taking a self guided tour around the brick pathways and under brick archways. 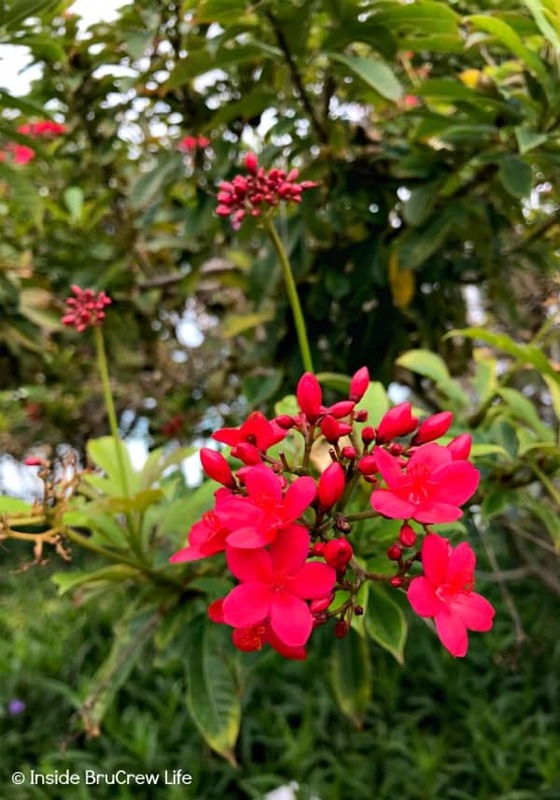 A quiet and relaxing stroll while enjoying the plants and butterfly garden is just what we needed after a busy day of Key West sight seeing. There are also multiple gazebos that you can stop and sit in while you enjoy the ocean views.